Carson House, located in the community of Pleasant Gardens alongside Buck Creek four miles west of Marion in McDowell County, exemplifies nineteenth-century Piedmont North Carolina life. From 1843 to 1845 the home served as the seat of county government. The oldest section of the house consists of a single-pen, two-story log building over a full cellar, built by planter John Carson in 1793. After inheriting the property in 1841, Carson's son Jonathan Logan Carson oversaw major renovations, including an imposing double-porch facade and interior and exterior features in the Greek Revival style. John Carson immigrated to America from Ireland in 1773 at age 21. A member of the Fayetteville convention that approved the federal Constitution in 1789 and a state legislator in 1805 and 1806, Carson married twice and fathered 12 children. Three of his sons also served in the state legislature. His son Samuel Price Carson served three terms in Congress and later became the first secretary of state of the Republic of Texas. After Jonathan Logan Carson's widow sold the house in 1884, the John Seawell Brown family owned the property for 23 years. In the twentieth century, the house passed through several owners before a group of local citizens bought it. Led by sisters Mary and Ruth Greenlee, the group restored the home in 1963, and the building now operates as a historical house museum filled with household and plantation artifacts. Moffitt Sinclair Henderson, A Long, Long Day for November (1972). 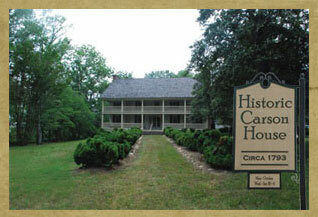 Michael Hill, Historical Research Report: The Carson House of Marion, North Carolina (1982). Historic Carson House, 1793. Image courtesy of Carson House Society. Available from http://www.historiccarsonhouse.com/ (accessed June 12, 2012).